HIP is a turtle who raps very slowly. HOP is a bunny who raps superfast. Together they are Hip & Hop, the coolest rap duo in Oldskool County. 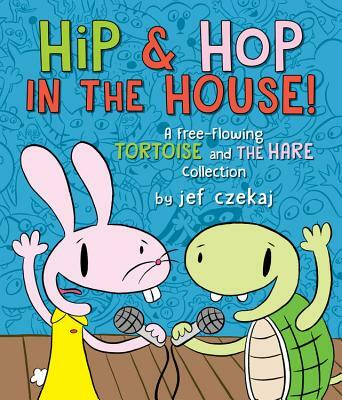 This hilarious collection features two stories that remix the fable of the tortoise and the hare, combining comic book elements with short raps, traditional narration, and the coolest characters on the block. Jef Czekaj is an award-winning cartoonist, illustrator, and musician. His comic strip "Grampa and Julie: Shark Hunters" ran in Nickelodeon Magazine for more than ten years. He has written and illustrated several children's books, including Cat Secrets. He is also the DJ for Big Digits. Jef lives and works in Somerville, Massachusetts. You can see more of his work online at www.czekaj.com.